Was the dashcam video titled MH17 Russian BUK launcher in Makiivka Ukraine video July 17 2014, uploaded to the Euromaidan PR channel in May 2016, actually filmed on July 17 2014 as claimed, or some weeks earlier? The latest episode from MH17 Inquiry suggests the latter. This wasn’t an ‘arbitrary accident’ with a few minutes left to pull the trigger. The plane was sent off course, on a lower altitude, over a place/area where opposite forces were fighting each other. This means it was planned way ahead [imho]. There is much room for speculation which naturally arises in the absence of confirmed data. We do not know why air traffic control gave the directions they did for example. One hypothesis I have read suggests that the intention was for the plane to crash on Russian territory, thereby increasing the propaganda value. It was shot down prematurely because the Ukrainian fighter pilot realised that the Russiand had a radar lock on his plane. I don’t know. The Dutch probably do know because the Americans have released their satellite data to the Dutch Security Services. It defies belief that the Dutch government does not also know. Exactly what Westerbeke knows is uncertain. His public comments have been ambiguous, but again logic would suggest that he does know but for a variety of reasons cannot say. The safest inference is that if the US satellite data showed Russian or separatist responsibility we would have heard about it loud and clear well before now. Therefore draw the most reasonable inference from that fact. An article I wrote for Off-Guardian almost exactly one year ago becomes ever more relevant as more evidence surfaces. Never before have people in the West been betrayed by their media in such a descpicable and craven manner. Timely reminder indeed. You should write something for us again Bryan – it’s been a while! I have a couple of pieces in the pipeline, Catte, but it’s been a long and hard winter in much more than one way. On the other hand, the more voices in the chorus the more persuasive the refrain. I’ll be back in a jiff. US satellites were keeping constant surveillance of Ukraine at the time, so would have the details of the launch, whence it came (if it was a BUK alone) etc. Do you imagine if it revealed categorical proof of Russia or resistance responsibility, that they would still be keeping it secret, and the vermin of the Western MSM propaganda sewer never daring to mention it? I thnk you should read my various articles on MH17 rather than speculate on what I might, or might not imagine. Then you wouldn’t have to. The ‘you’ was general Bryan, not specific to you. I wouldn’t have the effrontery to speculate on what you may or may not imagine. I will read your articles to see exactly what you did write. Sorry, Richard, I misunderstood. On the other hand, although your reply could have stood quite happily on its own, it was actually posted as a reply to my comment. Seen in that context it appears to have little or no relevance to my comment in particular. Having said that, it is highly relevant to the article, and extremely relevant to the downing of MH17, as the U.S. has refused all requests to share any satellite images with the investigating team. The refusal in itself acknowledges their existence. Bryan, that is not strictly correct. According to Fred Westerbeke who heads the JIT the Americans have supplied their satellite data to their inquiry. In his February letter he said that there were unresolved issues as to what use the data could be put. I suspect that is a reference to political issues rather than technical ones. If, for example, the satellite data showed Ukrainian responsibility for MH17 then that would pose huge political problems. If on the other hand it showed that responsibility rested with the separatists, one would imagine that the data would have been disclosed long ago. “There are also satellite data on the situation on the ground. To date the JIT has no satellite images of the launch of the missile. Because of clouds usable images are not available from the firing location at the time of day when the MH17 was shot down. However, there are images available just before and after July 17, 2014 that contribute to the investigation. Nowhere does it say that the US authorities have provided satellite evidence, though it does say JIT (Joint Investigation Team) has seen satellite data. Although the situation may have changed since then, I cannot remember reading that it has. Thank you for pointing it out, Richard. Perhaps you could post a link to that new information, so I can update my files for future reference, should I return to the subject in the future, as I’m sure I will. Bryan, it may be a question of semantics, but when the letter says the data have been shared with the Dutch intelligence services, I interpret that as the Americans having handed over the data. That is confirmed by the reference to restrictions on how it might be used. Westerbeke’s reference to cloud cover is nonsense. Two of the three satellites had infra red capability which is unaffected by cloud. Indeed, it is a matter of semantics to an extent, and a bit of jiggery-pokery here and there. Contrary to what you claimed in an earlier comment: “According to Fred Westerbeke who heads the JIT the Americans have supplied their satellite data to their inquiry.” Fred Westerbeke did not say American satellite data had been supplied to the (JIT) inquiry, far from it. He said the US data had “been confidentially shared with the Dutch Military Intelligence and Security Service (DISS).” The DISS is not part of the Joint Investigation Team (JIT). You are confusing one paragraph with another. Thinking the DISS is going to do anything but what it is told by its US master and counterpart is rather like expecting MI6 to have provided Chilcot with all the information they had for his inquiry into Iraq. In spook language the letter means “in no way is the inquiry going to get its little mitts on the evidence that really counts” which was the point of your reply to my original comment. You were right about that. Maybe you should have left it there, as Fred Westerbeke’s letter makes it quite clear he has not seen the US data, and doesn’t even have a clear idea of what it might be. I don’t wish to spar with you further, as I’m not trying prove anything here; apart from attempting to clear up a few points you made. I haven’t seen the video. Just want to say that some interested and knowledgeable people in Germany assume it to be a satire on Bellingcat. The video is right here – what do you mean you haven’t seen it? The video may be a bit odd but the investigation is way better than what bellingcat do which is sit on their asses posting on twitter. Yes. I just meant that I haven’t seen it yet. Obviously. Because I said so. For reasons of my own, related to the time available. I merely wanted to forward the POV of people who have occupied themselves with this for a long time because I thought it might be of interest. why not try thinking and speaking for yourself? Several of the bodies found in the wreckage of MH17 were wearing oxygen masks. So what was the deal there… the plane was hit mid-air by a missile…. and then people put on oxygen masks as the fragments of their former plane fell groundwards? Bellingcat is a fatal combination of stupidity, duplicity, mendacity and cupidity. Erm, my understanding is that the missile fired from a BUK delivery system would not have hit the Boeing directly. The missile would have exploded above or below the target aircraft and raked it with shrapnel. It’s important to mention that this is what the SA-11 missile would have done, if a BUK missile delivery system had fired the missile. Whoever gave the order to bring down the Malaysia Airlines jet probably relied on the MSM’s ignorance and the general public’s ignorance about how the passenger jet was hit. This narrative is necessary if people were to inquire closely into the nature of the damage inflicted on the Boeing 777. So if you ask how could people have put on oxygen masks if MH-17 had been hit directly, the answer would be that the missile had sprayed shrapnel around the body of the plane and this explains how passengers were able to react the way they did. The narrative also “explains” the damage done to the cockpit and wings which were peppered with puncture holes. Before anyone jumps to conclusions about what I think, I’m sure the Boeing had been fired on by one, and likely two Ukrainian fighter jets. The missile would have exploded above or below the target aircraft and raked it with shrapnel. Oh yes. The theory that BUKs are such clever missiles, that they find the cockpit of the target aircraft and ‘rake it with shrapnel’. I’m sure the Boeing had been fired on by one, and likely two Ukrainian fighter jets. Who would have been able to direct their cannon-rounds (not shrapnel) at the cockpit of MH17. This is borne out by examination of the wreckage, which clearly shows penetration by air-cannon fire (not shrapnel), in defined and targetted areas of the plane only. Actually the missile does explode a few feet away from the cockpit in a head on attack due to radar homing and the proximity fuse. The plane’s fuel can’t explode or even catch fire 10 km up due to insufficient oxygen. Thinking that Russian military intelligence would give the order to parade that BUK in the middle of the day throughout the main roads of many towns, on the way to one of the most heavily surveilled borders in the world at that time (in which, by the way, no one could take a picture of the same convoy..) and without even putting a damn piece of clothing over it; rather than hiding it, destroying it, dismantling it, etc; is well beyond stupid, very well beyond that point of having some kind of relation to how things work in reality. That would amount to a professional hitman running around drenched in blood and raising a riffle in a hurry to leave the scene of the crime. Absolutely. And beyond that, the idea the Russian government would order a BUK into Ukraine for the purpose of shooting down a commercial jet liner – as some allege – is simply insane. The idea they would give such a thing to untrained operatives in Donbass who shot the plane down “by mistake” is only a little more plausible, given the way BUK function. It’s possible a working BUK fell into the hands of the DPR I suppose, but without guidance systems and trained operatives could they even use it? Bottom line is that a BUK in “rebel” hands is purely theoretical, whereas we know beyond doubt the UAF had several working BUK at their disposal. Even more bottom line is the fact there is still no solid evidence a BUK of any description was involved in the MH17 tragedy at all. Catte, the answer to your point about whether the Donbass separatists could even use a BUK was addressed in Appendix T of the DSB Report which summarises the intelligence agencies view. Their conclusion was that there was no evidence that the separatists had possession of a BUK missile; no evidence they had the training or capability of firing a BUK, missile; and no evidence they had th motive to fire such a missile. If the separatists did have one, they scored a perfect direct hit on their first and only attempt at firing a missile. The Russians give a maximum probability of 90% for a successful hit using a single missle assuming a fully trained and exprienced crew with a full multi-vehicle system (ie with a long range radar rather than the 36 km or so for the TELAR alone). The odds do not add up. Moreover, a BUK is a guided missile. It’s not a firework which you point and hope. It needs a radar system to guide it to its target, otherwise its chances are nil. It’s been factually established that the only radar system in the area which could guide a missile was and remains in the hands of the Kiev government. This is, of course, if we also ignore the fact that the scatter pattern of the wreckage shows no evidence of a mid-air ‘hit’ of an aircraft 80% full of aviation fuel. The wreckage is instead consistent with an aircraft forced down by fire from another aircraft on the cabin. This would tally with a situation in which the pilots had been shot dead mid-air by another aircraft, and the (airworthy) aircraft went into tailspin from which it could not recover. Thus the wreckage shows that the oxygen mask system had deployed (how could it have done so if the plane exploded mid-air?) and some of the passengers had even put their masks on. These facts were intentionally ignored by the Dutch team, and omitted from their report. Moreover the radar system is tracking a target travelling at 500+ mph (with a potential top speed of 950 mph) at 10,000 metres / 30,000 feet. 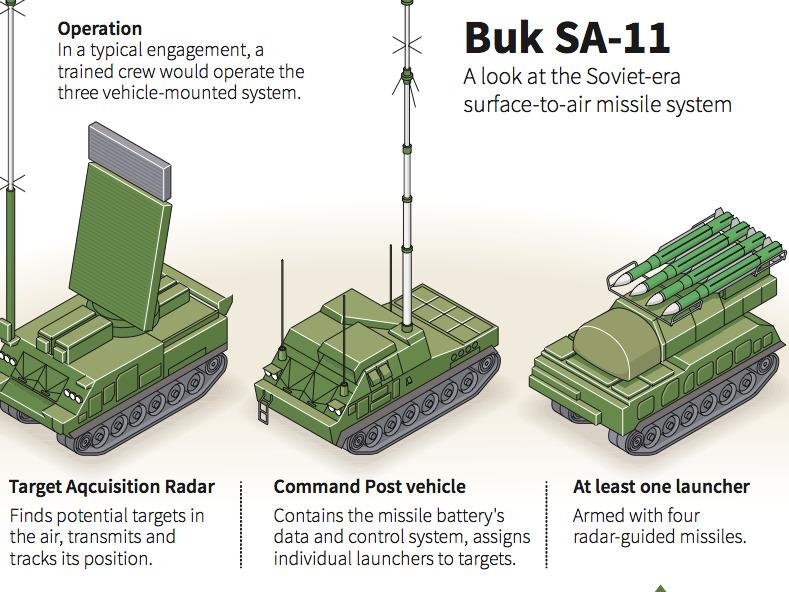 So a crew operating a 3-vehicle BUK missile delivery system must work very fast to track the target, transmit its position to the command-and-post vehicle which assigns the missile to follow the target and then launch the SA-11 from the third vehicle. I’ve heard the margin of opportunity allowed to track the Boeing would be something like 2 minutes. Yep. Plus a Buk simply isnt worth having without spare missiles for reloading. Uusally there’s another special Buk vehicle with a crane that carries them. Soviet/Russian doctrine requires 2 missiles on a target. So a Buk with 4 missiles and no reloads only has 2 shots before it is useless. ‘Insane’ is correct. The Australian PM at the time, the rabid Rightwinger Tony Abbott, immediately began spewing poisonous venom that the plane had been ‘deliberately’ shot down by ‘Evil Putin’ who he threatened to ‘shirt-front’ in an excess of psychotic belligerence. Unfortunately the thug didn’t live up to his threats when Putin attended the G20 Summit in Brisbane, because the sight of the thug being flipped by judo black-belt Putin would have been delicious. The elderberry bush has been added to the video, in order to obscure a vehicle with its open door, that would otherwise be obvious in the video. What sort of vehicle was it? Official? See the open door to the left of the highlighted bush and the shadow running left to right, directly below the open door. Only the video editor knows for sure why, but, the commentators voice IS overdubbed at timestamps 3.59-4.05, with the words “17th of July” when it is clear that he says “18th of July”. A minor point, but worth mentioning, given that OL media is easily manipulated and misinterpreted, often deliberately. 1 No it hasn’t, and there is literally nothing in the video that might give the slightest impression of such a “vehicle” real or imagined. 2 The date “problem” you apparently perceive is totally irrelevant since it’s part of the analysis, not the original video. We know the original video is alleged to have been made on July 17. Even if the presenter of this analysis did say “July 18” to camera it’s just a slip they corrected post-production. I’m afraid your points are more likely to blow smoke than clarify things. The elderberry bush is from mid-June, place unknown. The video was shot in mid-July, location known. That elderberry bush has no business being there, other than by having been edited in on purpose. It beggars belief then, that the angle the investigators choose to follow, is one that highlights the anomaly (the bush), against the time discrepancy of 3-4 weeks. The viewer should be screaming, bush, bush, bush and referring back to the video. Not bush, bush, bush and referring back to the date. You think it’s more likely they pasted in a fake elderberry bush rather than simply lied about the date? what are you on about Peter? the location is the same and is very well known. Its the garage in Makeevka. There are numerous videos filmed there. Is it just me or do there seem to be a lot of people on this thread blowing smoke? The video does a pretty good investigation based on the vegetative stages of plants visible in the dashcam footage. It all boils down to whether or not you accept the bush is an elderberry plant. Can’t say for sure but it does look like one. And they also showed how common they are in the Donbas. the elderberry bush is in the original Buk Makeevka video. Nothing has been altered. Why have your enquiries not demanded that Kiev ATC finally make available the transcripts of the tower’s conversations with MH17 in the period prior to the crash? Surely these would be germane to the investigation? The evidence against Kiev & its US master in the shooting down of MH17 is as overwhelming as the complicity in murder by the EU political elite who will soon be voted out of office ! I wonder how many UK MPs will watch this video?? All of them should be required to. Poor little children fed their propaganda and mouthing it like good little boys and girls when teacher tells them to. Isn’t it strange that children who question teacher’s wisdom are ‘troublemakers’, ‘difficult children’ or the like? Sometimes, difficult children are required to save the world from itself……. Just saying, but why do you suppose, has the commentators voice in this YouTube video, been overdubbed at timestamp 3.59, with the words “17th of July”? I’m no lip reader, but it does appear that he says something along the lines of “18th of July” instead. what possible importance could that have? it’s not disputed anywhere that the Makeevka video is purpoted to have been shot on the 17th. if he got the date wrong and it was later edited rather than reshoot the video, so what. the BBC does stuff like that. In all cases the avtotransportna road video quality is so abysmal it must have been deliberately mushed before publication. Yes, but Bellingcat has never been nearer Ukraine than Sheffield for the entire duration of this sordid travesty. Bellingcat really doesnt like these MH17 Inquiry guys. How dare they go to the actual scenes and conduct investigations. Next PostWhat will it take to awaken us to the “impending danger”?